Dentists across Montreal are raving about Drum & Bass after the successful launch of their Oral Hygiene/Aural Hygiene campaign. “Dentistry hasn’t evolved all that much over the last few decades,” says Amir Khaledra, the president of the Quebec Dental Supremacy Foundation. “We wanted to change that, so the dentists of Montreal got together and cooked up a new way to make dentistry exciting again. The result was our OHAH campaign, where we turn a trip to the dentist into a party." As part of the OHAH campaigns, dentists have started playing Drum & Bass music during dental sessions. “You wouldn’t think that raving and dentistry go well together,” says Montreal dentist Yvette Couteau, “but they do! In fact, I feel that dancing to DnB while I operate on my patients has really improved my skills as a dentist." Customers agree. “I used to dread going to dentist,” says former meth addict Brianna Grace, “but ever since my dentist started playing drum and bass during our appointments, I just can’t wait to go and have what’s left of my teeth checked out." Rave Promoters are getting in on the act. “We’ve started inviting dentists to perform check-ups at our parties,” says party promoter Yoga Biddleson. “And ravers really seem to love it." “I hadn't been to a dentist in years,” says 23-year-old McGale student Lee Sania. 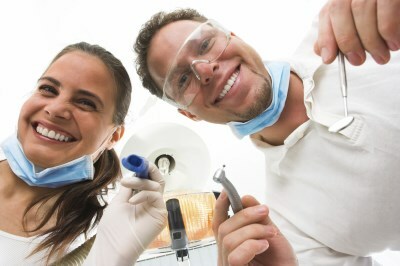 “But then I saw a dental booth at the EDM party I went to last Friday, and I said what the hell, you only live once. It was the best dental check-up I ever had. I was tripping on MDMA, the music was blasting, and there was a dentist all up in mouth. It was fantastic." Raver dentistry has been so popular, that Amir says dentists across North America have been calling him to ask about it. “I think you’ll start seeing more and more dentists opening up booths at parties and clubs throughout the rest of Canada and the United States,” says Amir. “Dentistry just levelled up."